Shuck and Jive: She Didn't??!! Yup, the first casualty of the war on Christmas. 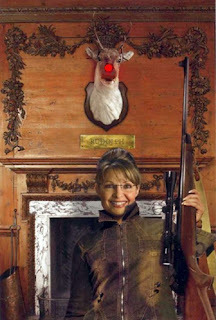 She just had to stop that funny looking Moose from signaling Russia with his nose. Just more national security experience for her resume'. Oh, and a very merry Christmas to you and yours John. Here's to peace, love and equality for all man kind. Merry Christmas, Captain! Right on with the peace, love, and equality!